Dante is a complete, reliable solution for high-performance audio distribution over standard IP networks, supporting hundreds of simultaneous channels of uncompressed audio with ultra-low latency and sub-microsecond synchronization accuracy. Dante-enabled products interface standard microphone and line-level audio signals, and the entire group of endpoints to a Dante audio network. Vellone Communication is Dante Certified. ECLER DN44BOB is a 4 inputs and 4 outputs DANTE (Audio Over IP) Break Out Box. It allows to convert 4 analogue audio signals into 4 DANTE channels and send them into an Ethernet LAN, as well as to take 4 DANTE channels from the Ethernet network and convert them to analogue audio signals. It includes 4 GPI control ports (0-10VDC) and 4 GPO control ports (NO/NC relays). Can be used together with EclerNet DANTE ready products or as a stand-alone DANTE interface, together with any audio device including analogue audio inputs and/or outputs. 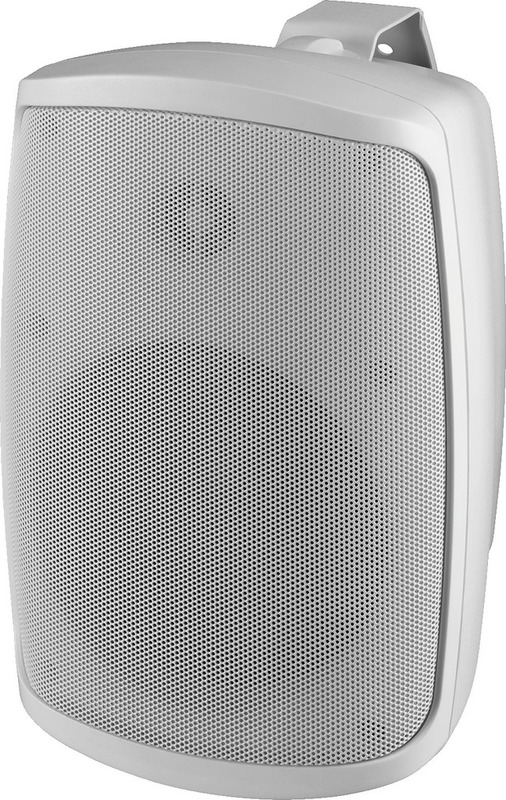 The wall speaker WALL-05DT perfectly meets every requirement. 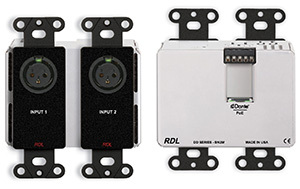 It is not just a DSP module but also features an integrated 2-channel Dante™ module. 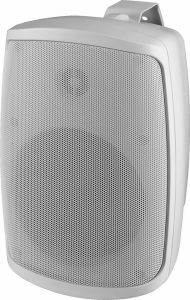 This Dante™ speaker is particularly suitable for commercial applications in the professional sector. It can be used for applications where several audio channels have to be transmitted over great distances and to different areas or locations. The fields of application include schools, office buildings, fitness centres, shops and restaurants. Digital transmission provides several advantages over analogue transmission. Even in case of greater distances, the signal features a comparably low susceptibility to interference and analogue audio transmissions also require a higher cable quality. In comparison with other Audio over Ethernet applications, e.g. CobraNet or EtherSound, Dante™ can support gigabit applications with several channels, features a lower latency and automatic configuration. The power for WALL-05DT is supplied via PoE (Power over Ethernet) or via a 12 V power supply which is available at option. Furthermore, the integrated DSP module can be controlled via app which provides the most important functions like master volume control and controls for treble, midrange and bass. The RU-NL2 modules are Dante audio network interface products compatible with line-level audio equipment inputs. These modules are designed to be mounted in equipment racks, closets, conference tables and on shelves or backboards in commercial/industrial installations. 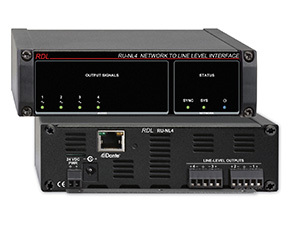 The RU-NL4 modules are Dante audio network interface products compatible with line-level audio equipment inputs. These modules are designed to be mounted in equipment racks, closets, conference tables and on shelves or backboards in commercial/industrial installations. The DD-BN22 is a complete wall-mounted Dante audio network interface. It features two XLR mic or line inputs and two XLR mic or line outputs on the front panels. Special software is not required to configure the DD-BN22. Each XLR input provides three switches that may be set from the front of the unit when the cover plate is not installed. One switch enables or disables P48 phantom; the second switch selects the mic or line gain range; the third switch sets the gain. Each XLR output provides a switch to set the output to balanced professional line level or mic level. The DD-BN22 fits a standard US dual-gang electrical box or an RDL WB-2 back box for installations in thinner European or equivalent walls. The DD-BN22 is PoE powered, and is available in multiple finishes with optional customized graphics. The DD-BN2M is a complete wall-mounted Dante audio network interface. It features two XLR mic or line inputs on the front panels, plus two line outputs on a rear-panel detachable terminal block. Special software is not required to configure the DD-BN2M. Each XLR input provides three switches that may be set from the front of the unit when the cover plate is not installed. One switch enables or disables P48 phantom; the second switch selects the mic or line gain range; the third switch sets the gain. Each rear-panel output provides a switch to set the output to balanced professional or unbalanced consumer level. The DD-BN2M fits a standard US dual-gang electrical box or an RDL WB-2 back box for installations in thinner European or equivalent walls. The DD-BN2M is PoE powered, and is available in multiple finishes with optional customized graphics. 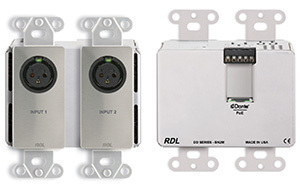 The DD-BN2ML is a complete wall-mounted Dante audio network interface. It features one XLR mic or line input and one mono-summed Mini-jack line input on the front panels, plus two line outputs on a rear-panel detachable terminal block. Special software is not required to configure the DD-BN2ML. The XLR input provides three switches that may be set from the front of the unit when the cover plate is not installed. One switch enables or disables P48 phantom; the second switch selects the mic or line gain range; the third switch sets the gain. The Mini-jack input accepts mono or stereo unbalanced line-level sources that are summed to mono. Each rear-panel output provides a switch to set the output to balanced professional or unbalanced consumer level. 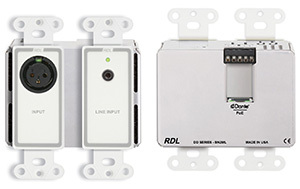 The DD-BN2ML fits a standard US dual-gang electrical box or an RDL WB-2 back box for installations in thinner European or equivalent walls. The DD-BN2ML is PoE powered, and is available in multiple finishes with optional customized graphics. The DD-BN31 is a complete wall-mounted Dante audio network interface. It features two XLR mic or line inputs, one stereo Mini-jack line input and one stereo Mini-jack line output on the front panels, plus two line outputs on a rear-panel detachable terminal block. Special software is not required to configure the DD-BN31. Each XLR input provides three switches that may be set from the front of the unit when the cover plate is not installed. One switch enables or disables P48 phantom for that input; the second switch selects the mic or line gain range; the third switch sets the gain. The Mini-jack input provides a switch to configure the input for stereo or summed mono. The Mini-jack output provides a switch to configure the output for stereo or left-channel mono. Each rear-panel output provides a switch to set the output to balanced professional or unbalanced consumer level. The DD-BN31 fits a standard US dual-gang electrical box or an RDL WB-2 back box for installations in thinner European or equivalent walls. The DD-BN31 is PoE powered, and is available in multiple finishes with optional customized graphics. The DD-BN40 is a complete wall-mounted Dante audio network interface. It features four XLR mic or line inputs on the front panels and two line outputs on a rear-panel detachable terminal block. Special software is not required to configure the DD-BN40. Each input provides three switches that may be set from the front of the unit when the cover plate is not installed. One switch enables or disables P48 phantom for that input; the second switch selects the mic or line gain range; the third switch sets the gain. Each output provides a switch to set the output to balanced professional or unbalanced consumer level. The DD-BN40 fits a standard US dual-gang electrical box or an RDL WB-2 back box for installations in thinner European or equivalent walls. The DD-BN40 is PoE powered, and is available in multiple finishes with optional customized graphics. The DDB-BN22 is a complete wall-mounted Dante audio network interface. It features two XLR mic or line inputs and two XLR mic or line outputs on the front panels. Special software is not required to configure the DDB-BN22. Each XLR input provides three switches that may be set from the front of the unit when the cover plate is not installed. One switch enables or disables P48 phantom; the second switch selects the mic or line gain range; the third switch sets the gain. Each XLR output provides a switch to set the output to balanced professional line level or mic level. The DDB-BN22 fits a standard US dual-gang electrical box or an RDL WB-2 back box for installations in thinner European or equivalent walls. The DDB-BN22 is PoE powered, and is available in multiple finishes with optional customized graphics. The DDB-BN2M is a complete wall-mounted Dante audio network interface. It features two XLR mic or line inputs on the front panels, plus two line outputs on a rear-panel detachable terminal block. Special software is not required to configure the DDB-BN2M. Each XLR input provides three switches that may be set from the front of the unit when the cover plate is not installed. One switch enables or disables P48 phantom; the second switch selects the mic or line gain range; the third switch sets the gain. Each rear-panel output provides a switch to set the output to balanced professional or unbalanced consumer level. The DDB-BN2M fits a standard US dual-gang electrical box or an RDL WB-2 back box for installations in thinner European or equivalent walls. The DDB-BN2M is PoE powered, and is available in multiple finishes with optional customized graphics. 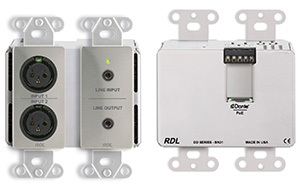 The DDB-BN2ML is a complete wall-mounted Dante audio network interface. It features one XLR mic or line input and one mono-summed Mini-jack line input on the front panels, plus two line outputs on a rear-panel detachable terminal block. Special software is not required to configure the DDB-BN2ML. The XLR input provides three switches that may be set from the front of the unit when the cover plate is not installed. One switch enables or disables P48 phantom; the second switch selects the mic or line gain range; the third switch sets the gain. The Mini-jack input accepts mono or stereo unbalanced line-level sources that are summed to mono. Each rear-panel output provides a switch to set the output to balanced professional or unbalanced consumer level. The DDB-BN2ML fits a standard US dual-gang electrical box or an RDL WB-2 back box for installations in thinner European or equivalent walls. The DDB-BN2ML is PoE powered, and is available in multiple finishes with optional customized graphics. The DDB-BN31 is a complete wall-mounted Dante audio network interface. It features two XLR mic or line inputs, one stereo Mini-jack line input and one stereo Mini-jack line output on the front panels, plus two line outputs on a rear-panel detachable terminal block. Special software is not required to configure the DDB-BN31. Each XLR input provides three switches that may be set from the front of the unit when the cover plate is not installed. One switch enables or disables P48 phantom for that input; the second switch selects the mic or line gain range; the third switch sets the gain. The Mini-jack input provides a switch to configure the input for stereo or summed mono. The Mini-jack output provides a switch to configure the output for stereo or left-channel mono. Each rear-panel output provides a switch to set the output to balanced professional or unbalanced consumer level. The DDB-BN31 fits a standard US dual-gang electrical box or an RDL WB-2 back box for installations in thinner European or equivalent walls. The DDB-BN31 is PoE powered, and is available in multiple finishes with optional customized graphics. The DDB-BN40 is a complete wall-mounted Dante audio network interface. It features four XLR mic or line inputs on the front panels and two line outputs on a rear-panel detachable terminal block. Special software is not required to configure the DDB-BN40. Each input provides three switches that may be set from the front of the unit when the cover plate is not installed. One switch enables or disables P48 phantom for that input; the second switch selects the mic or line gain range; the third switch sets the gain. Each output provides a switch to set the output to balanced professional or unbalanced consumer level. The DDB-BN40 fits a standard US dual-gang electrical box or an RDL WB-2 back box for installations in thinner European or equivalent walls. The DDB-BN40 is PoE powered, and is available in multiple finishes with optional customized graphics. The DDS-BN22 is a complete wall-mounted Dante audio network interface. It features two XLR mic or line inputs and two XLR mic or line outputs on the front panels. Special software is not required to configure the DDS-BN22. Each XLR input provides three switches that may be set from the front of the unit when the cover plate is not installed. One switch enables or disables P48 phantom; the second switch selects the mic or line gain range; the third switch sets the gain. Each XLR output provides a switch to set the output to balanced professional line level or mic level. 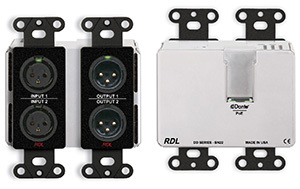 The DDS-BN22 fits a standard US dual-gang electrical box or an RDL WB-2 back box for installations in thinner European or equivalent walls. 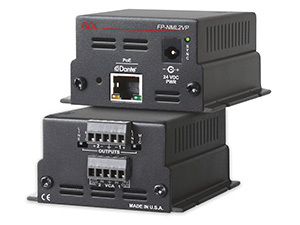 The DDS-BN22 is PoE powered, and is available in multiple finishes with optional customized graphics. 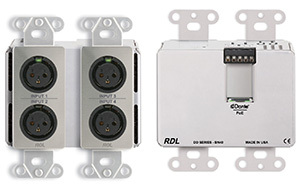 The DDS-BN2M is a complete wall-mounted Dante audio network interface. It features two XLR mic or line inputs on the front panels, plus two line outputs on a rear-panel detachable terminal block. Special software is not required to configure the DDS-BN2M. Each XLR input provides three switches that may be set from the front of the unit when the cover plate is not installed. One switch enables or disables P48 phantom; the second switch selects the mic or line gain range; the third switch sets the gain. Each rear-panel output provides a switch to set the output to balanced professional or unbalanced consumer level. 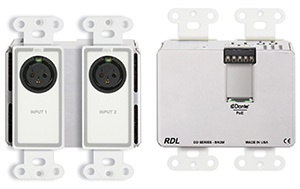 The DDS-BN2M fits a standard US dual-gang electrical box or an RDL WB-2 back box for installations in thinner European or equivalent walls. 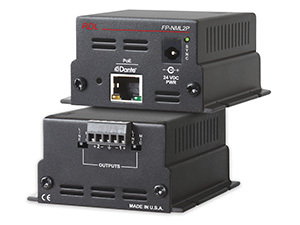 The DDS-BN2M is PoE powered, and is available in multiple finishes with optional customized graphics. 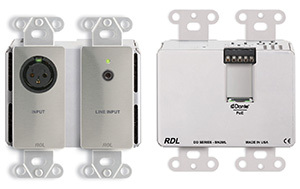 The DDS-BN2ML is a complete wall-mounted Dante audio network interface. It features one XLR mic or line input and one mono-summed Mini-jack line input on the front panels, plus two line outputs on a rear-panel detachable terminal block. Special software is not required to configure the DDS-BN2ML. The XLR input provides three switches that may be set from the front of the unit when the cover plate is not installed. One switch enables or disables P48 phantom; the second switch selects the mic or line gain range; the third switch sets the gain. The Mini-jack input accepts mono or stereo unbalanced line-level sources that are summed to mono. Each rear-panel output provides a switch to set the output to balanced professional or unbalanced consumer level. 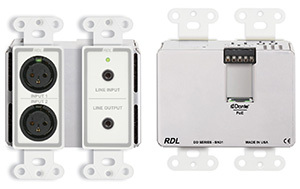 The DDS-BN2ML fits a standard US dual-gang electrical box or an RDL WB-2 back box for installations in thinner European or equivalent walls. The DDS-BN2ML is PoE powered, and is available in multiple finishes with optional customized graphics. 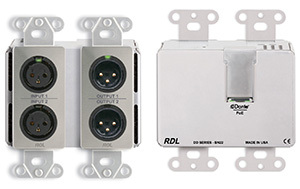 The DDS-BN31 is a complete wall-mounted Dante audio network interface. It features two XLR mic or line inputs, one stereo Mini-jack line input and one stereo Mini-jack line output on the front panels, plus two line outputs on a rear-panel detachable terminal block. Special software is not required to configure the DDS-BN31. Each XLR input provides three switches that may be set from the front of the unit when the cover plate is not installed. One switch enables or disables P48 phantom for that input; the second switch selects the mic or line gain range; the third switch sets the gain. The Mini-jack input provides a switch to configure the input for stereo or summed mono. The Mini-jack output provides a switch to configure the output for stereo or left-channel mono. Each rear-panel output provides a switch to set the output to balanced professional or unbalanced consumer level. The DDS-BN31 fits a standard US dual-gang electrical box or an RDL WB-2 back box for installations in thinner European or equivalent walls. The DDS-BN31 is PoE powered, and is available in multiple finishes with optional customized graphics. 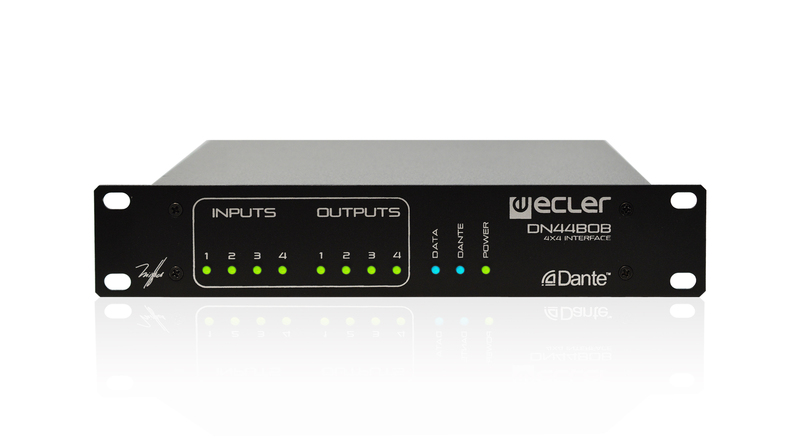 The DDS-BN40 is a complete wall-mounted Dante audio network interface. It features four XLR mic or line inputs on the front panels and two line outputs on a rear-panel detachable terminal block. Special software is not required to configure the DDS-BN40. Each input provides three switches that may be set from the front of the unit when the cover plate is not installed. One switch enables or disables P48 phantom for that input; the second switch selects the mic or line gain range; the third switch sets the gain. Each output provides a switch to set the output to balanced professional or unbalanced consumer level. 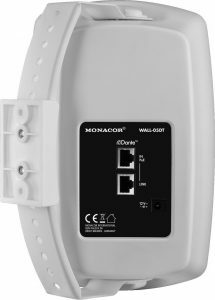 The DDS-BN40 fits a standard US dual-gang electrical box or an RDL WB-2 back box for installations in thinner European or equivalent walls. The DDS-BN40 is PoE powered, and is available in multiple finishes with optional customized graphics. The FP-NML2 modules are Dante audio network interface products compatible with mic-level or line-level audio equipment inputs. These modules are designed to be mounted in equipment racks, closets, conference tables and on shelves or backboards in commercial/industrial installations. The FP-NML2V modules are Dante audio network interface products compatible with mic-level or line-level audio equipment inputs. These modules are designed to be mounted in equipment racks, closets, conference tables and on shelves or backboards in commercial/industrial installations.